German tenor saxophonist and composer Norbert Stein calls his work “pata music,” following Alfred Jarry and his mock-science of pataphysics, variously defined as the science of exceptions, the contradictory or of the illogical. Jarry was a master at skewing time. He rewrote the passion of Christ in the language of a modern sports commentator and began his near-novel Dr. Faustroll, Pataphysician, “Dr. Faustroll was sixty-three years old when he was born in Circassia in 1898 (the 20th century was (--2) years old).” It’s this fluid approach to the idea of time that connects Jarry with Norbert Stein, whose work focuses on a sense of flux. 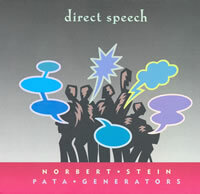 Although Stein has employed various materials from world music in his compositions and improvisation, the Pata-Generators quintet heard here may be his most directly related to jazz. Flutist Michael Heupel and trombonist Matthias Muche join Stein on unison heads, while bassist Sebastian Gramss and drummer Christoph Haberer function as a rhythm section, maintaining framework and coherence. So for all the pataphysics, what makes this music immediately accessible is that it’s rooted in the formal patterns of modern jazz while making fresh – genuinely unexpected – uses of those traditional elements. The opening track has strong hints of inspiration in early Archie Shepp, Stein generating great vocalic bluster against the more orderly voices of his compositions. He wanders all over time, rushing, slowing and delaying the beat, all in a brilliantly slurred filibuster. It’s as if he’s identified a particularly lively moment in jazz discourse, from which his compositions make various forays to touch on a host of forms (”For: Get It!” is a round) and moods, at one point a certain formal turn chiming with Heupel’s refined flute sonority suggests the Chico Hamilton Quintet, 50s vintage. “Alice in the Parallel World” has hints of the Gil Evans/ Miles Davis collaborations in its voicings and rhythms. But there’s a central vision and animation to all of this that makes it an ensemble of striking power (think the Albert Mangelsdorff Quintet of “Now Jazz Ramwong”). How often does one get a chance to hear a musician whose conception of time seems simultaneously shaped by Alfred Jarry and Archie Shepp? Trombonist Swell is not so much the leader as the convener of this marvelous free jazz session featuring reed player Sabir Mateen, trumpeter Roy Campbell, bassist Hill Greene, and drummer Klaus Kugel. Everyone here is part of a tightly knit musical community and like any five Blue Note label musicians of the ’60s, they play naturally and comfortably together whenever they pop up on one another’s albums. Here, they play a particularly gritty and feisty New York form of jazz free improvisation, more indebted to American idioms than European models. It’s marked by an appreciation for the lyrical, bluesy, and linear side of free improve – an approach that is more closely tied to bop and swing – and a willingness to use devices from throughout jazz history in high energy contexts characterized by close attention to form and contrast. It’s development, and eventual flowering in bands such as Test and Other Dimensions in Music, has often been misconstrued as little more than a retread of ’60s free jazz. It’s true that the musicians on this album owe a debt to the New York avant-garde jazz of the 1960s, but using the music of a previous era as a foundation, they have created a music that is distinct from it. 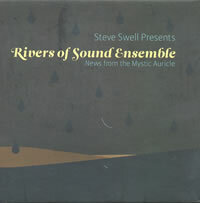 The three improvisations on this disc each follow a unique arc; there’s a sense the band is actively avoiding any repetition in the outlines of their spontaneous compositions. “Journey to Omphalos,” for example, starts with the horns creating a hushed sense of expectation, quickly peaks in a collective improvisation, then falls back and levels out for lengthy soloing. It’s like a trip down a mountainside, across a valley and up an opposite ridge. “News from the Mystic Auricle” falls into sections like the verses in a poem – a duo for bowed bass and cymbals, a quintet collective, a duo for plucked bass and drums struck by sticks, a sequence of three horn-plus-rhythm trios, and a final collective. This sort of attention to form a sure sign that free improvisation has moved beyond the models of the 1960s. The sure sense of line and melody each musician possesses is another indication of the music’s unique place in the free jazz idiom. On “Healix,” Campbell excels at free lyrical statements that embed pure sound deeply in the development of line, just as easily as allusions to blues and bebop. On the title track, Mateen inserts tangential phrases that disrupt his carefully developed ideas and sends them in new directions. Like Campbell, he opens up his spontaneous melodies with a vocabulary of shrieks and growls fitted to the general shapes and rhythms of his phrasing. Swell offers more highly contoured phrases that swing between extremes of his instrument’s range and twisting peripatetic lines that follow wild loops and leaps. Hill Green is unassuming at times, although always apt, but then does something to startle you. His flight-of-the-bumblebee plucking on “Journey to Omphalos” and his heavy, thrumming low notes that accompany Swell on “Healix” are highlights of the album. Kugel has power to spare but excellent judgment and instincts about when to push and when to let things simmer. Together they make engaging music full of life and surprises. 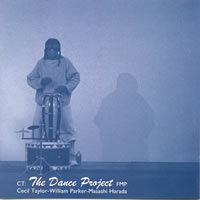 This LP-length recording documents a 1990 Berlin project that included dancers as well as bassist William Parker and percussionist Masashi Harada, emphasizing not only the pianist’s passion for dance but for phonemes, as well. Subsequently, Taylor is away from the piano for about ¼ of the running time, much of which occurs during the opening movement of the first of two pieces, “Astral Fluid on the Earth.” Except for Taylor’s brief, ruminative, parameter-setting passage, the movement is largely a Parker solo constructed from long tones, their Garrisonesque qualities buttressed by their somewhat distant, even muffled presence in the mix. When Taylor settles at the keyboard, he covers a lot of terrain in, what is for him, short order. There’s an antiphonal quality to his playing on the short, silence-punctuated conclusion of the opener; delicate pianissimo arpeggios are answered by blunt force, clusters by well-etched lines, and dramatic bursts with pensive, decaying phrases. With Harada only making his first entrance well into the first movement of “Soul Activities,” Taylor uses silence to create even greater suspense and drops in a few vague suggestions of cadence and splashes of an Ellington-inspired sepia tone in the solo prelude and in tandem with Parker, who segues from mournful arco to a brisk pizzicato line. However, Harada’s malleted cymbal swells and bursts of drums quickly trigger Taylor’s thunder. This is probably where the presence – literally or figuratively – of dancers comes in; instead of the expected extended torrents, Taylor swells and ebbs for the remainder of the album. The resulting push-pull between the three musicians is quite distinct from Taylor’s usual glorious steamrolling. Far from a basic Taylor library item, The Dance Project nevertheless has sufficient quirks and anomalies to engage his veteran listeners. 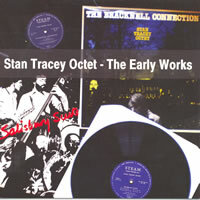 Stan Tracey formed his Octet in the mid 1970s to reinvigorate his writing, which had been back-burnered during a period that emphasized free improvisation in duos with Mike Osborne and in larger ensembles such as Splinters and Tentacles. Though the Octet’s charts were decidedly mainstream by comparison, Tracey’s exhilarating brand of swing and winsome lyricism prevented them from sounding dated. By the time the Octet recorded The Bracknell Connection at London’s 100 Club in late ’76, there were a few key changes in personnel. Art Themen’s trenchant tenor and soprano saxophones proved to be the perfect complement to Peter King’s soaring alto and Don Weller’s boisterous, frequently bristling tenor. Bassist Dave Green and drummer Bryan Spring were a well-oiled rhythm machine, able to sustain breakneck tempi and amen the hallelujah of the pianist’s Ellington-inspired comping. With trumpeter Harry Beckett and trombonist Malcolm Griffiths still on board, Tracey had a crew that challenged the structural integrity of any roof they played under. The 100’s is put to an immediate test on the wryly titled “Cuddly,” a stampeding, blues riffs-based workout, which opens The Bracknell Connection, the earlier of the two albums collected on this 2-CD set. Even when they are relatively compact, tucked into more detailed charts like “Agitato-Sympatico,” which juxtaposes angular and surprisingly sunny passages, the solos are barely contained blazes. When Tracey lets his cohorts run wild, as is the case with Themen and Weller’s unaccompanied slugfest on the LP’s finale, “Timespring,” the results defy the now conventional wisdom that the most inspired improvised music of the day was created by radical phalanges. This is borne out even more profoundly on the collection’s lone bonus track, “Chiffik,” a rare example of Tracey’s practice of giving freely improvised encores; recorded at the Octet’s ’76 Salisbury Arts Festival performance, this almost twenty-minute piece not only featured incisive solos and polyphone but organically developed ensembles that could pass as predetermined. Recorded less than a year and a half after The Bracknell Connection, The Salisbury Suite finds Tracey articulating an arguably more forceful melding of his writing, his playing and that of his collaborators, which now included alto saxophonist Jeff Daly, a very capable substitute for King. “Peg-Leg Bates” is a flurry of jabbing ostinati and careening lines anchored by Tracey’s unique two-fisted piano. The tug between wistfulness and steely determination on “Ballad for St, Ed,” creates a dramatic tension that almost presages David Murray’s later octet charts. And, clocking in just under a half-hour, “Miff” is a tour de force of hard-swinging ensembles and paint-peeling solos. One wonders if Gil Evans, for whom the Octet opened with this performance, won back the crowd at Royal Festival Hall. Shirley Scott’s last recording was a unexpectedly pungent affair, done at Van Gelder’s for Candid and with a bunch of young studs in support, Tim Warfield and Terell Stafford among them. They’d worked together on Bill Cosby’s show You Bet Your Life, so it wasn’t just an A&R put-up. A Walkin’ Thing wouldn’t make anyone’s list of modern classics, but if you dropped this 1992 date – Shirley passed away a decade later – session down among some vintage Blue Notes and Prestiges I doubt anyone would be much the wiser. It’s very much in that idiom, relaxed blowing jazz of the kind you automatically associate with Stanley Turrentine, who was once Mr Scott. Given that, it’s surprising how stiff and written Warfield’s albums for Criss Cross have been. He made his debut for the label two years after the appearance with Shirley and after his coming out as one of the Tough Young Tenors, an only intermittently successful attempt to launch a new heavyweight division; Warfield and James Carter did ok subsequently, but what of Herb Harris, Walter Blanding Jr, Todd Williams? Perhaps Carter did more than ok, but Warfield seems stuck in that awkward very-quite-good category where the work is accomplished enough but seems to lack a vivifying personality. A Cool Blue was good; A Whisper in the Night was better, largely because Stefon Harris sprinkled some magic over the date. Gentle Warrior and Jazz Is . . . added Nicholas Payton the mix, but because Payton and Stafford are stylistically conjoined, the recruitment didn’t add much texture or harmonic variety. Then there was a bit of a gap and one wondered if Warfield had gone to join that strange throng of jazz artists who make a flurry of discs under contract or under a benevolent label arrangement and then disappear back into whatever it is constitutes the dark matter of the jazz universe: local scenes, studio work, sections, commercial recording. Warfield hasn’t gone supernova with this one, but his full and, yes, tough tenor tone does seem to have found the right setting. He actually makes something of Sonny Bono’s spun-sugar “The Beat Goes On,” the kind of theme you can imagine big Stan transforming, but more important he makes genuinely forceful and highly personal statements on both “Tokyo Girl” (for me, Warfield’s best composition to date) and the glorious “Sometimes You Got To Let The People Know” and “Lullaby for Nijee,” which come in a close equal second. “Oasis” was the title tune of a 1989 Muse album with Virgil Jones and Charles Davis. I also have it on an obscure LP from Traveler’s Lounge in Miami from a dozen years earlier with Pete Minger and Jimmy Forest (and strictly under trombonist Al Grey’s leadership). The older guys bring a definite quality. The music seems to come out of a life-experience rather than a strictly musical one. Try as they might, Warfield and Stafford sound well-behaved and schooled, which means that the rest of the band is pretty critical to the success of the project. Hammond man Pat Bianchi is authentic-sounding, rolling and soulful, and Stafford ’s trumpet sounds extra-fruity on this occasion but with enough pip and pith to keep it from being too smooth and unctuous. I really like the percussion work, though. Byron Landham has credits with Joey DeFrancesco and with fellow-Criss Crosser Orrin Evans. He’s never been so good on record as on this, perhaps because Daniel G. Sadownick, added on percussion here and there, gives him the freedom to play rather than simply count. 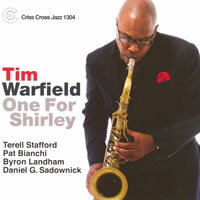 I loved “One For Shirley,” both the song and the record, and I think it might have rebooted Warfield’s recording career, which was starting to drift towards the Soft-Centered Middle-Aged Repertory Tenor niche, which is, uh, double booked right now.